Would it be nice if your child was able to speak your (your family’s) native language? But do you feel that no matter how hard you try he is losing it? Many immigrant families in the U.S, France, Germany, Spain and other countries feel that way. Is there a way to help your child to keep it and to be able to use it? I say that you (the child’s parents) know your native language well enough, then it shouldn’t be a problem at all for your child. Persistence is a key word here. In this article I will share some LOL (laws of language), or, the tips, which, I believe, are critical in preserving your native language. Those are the same principles I use in my own family, and all my 3 children (3, 8, 10) speak, read and write fluently in Russian. And because I live in the US, and my native language is Russian, I will refer to this language in the article. Feel free to substitute it for your own language/country – the LOL (laws of language) will stay the same. 1. The top secret here (which is not really a secret) is to speak this language exclusively at home. You know that learning comes from hearing and practicing (repeating). Make your child to constantly hear Russian language when you, the parents, speak it, and make him or her to answer your questions, or make their initial requests ONLY in Russian. One of two things can happen: either you will shift to your child’s language (English), or child will shift to yours (Russian). It’s proven. I have seen lot’s of families, and it goes like this: if Russian has always been spoken at home, kids will always use Russian to communicate with family members. No matter where they are (school, clinic, store, etc…), they will talk in Russian to their parents. It’s psychology – their brain clicks to adjust to the correct language with correct people…or else, you can call it a habit. By the way, this “clicking” makes brain to work harder, which increases children’s intelligence. My kids see (or hear) me speaking in English only to the people that cannot speak Russian. And guess what – they do the same thing. So, the rule of thumb here is: when kiddo approaches you speaking in English, please don’t bother to “transfer” to his language; stay at your territory, thus, helping a child to practice more and to develop a habit to use Russian language. And to be honest – this strategy along is, pretty much all it takes to develop fluency. Let me note that it’s not just about oral communication when it comes to the use of language at home. This includes everything you use to communicate with your child: leaving a voicemail, text messaging (I have this trick for texting: when I have to send a text message (in Russian), I ask my kids to do it for me (usually it happens when I drive). I don’t have to tell you how much they love “texting.” I kill 3 birds with one stone here: 1. Practicing and using their Russian skills (sending a text is all of it: reading, writing, sometimes composing, and typing. 2. Showing them example of not using a phone while driving. 3. Allowing them to play with technology in a safe and trusted manner. Be sure that if they have done some secretarial tasks for me, they are less likely to ask to play a game “while we are driving”). All the notes like “the soup is in the fridge” you leave for a child – write them in Russian. Wall calendars, signs, games, apps, etc. During the summer time, we love doing scavenger hunt, and there a fair amount of writing with directions and assignments – it’s all in Russian. All the youtube videos, games and cartoons – I am pretty sure you can always find a substitute for any video in a Russian language (though I will not suggest to rely much on the “screen,” due to many disadvantages of it). I am sure you are a smart and creative mom (or dad) and will come up with the bunch of other ways to practice it. Then, let’s go to #2. 2. Reading. Though not too many parents will prioritize that one, I can’t stress enough the effectiveness of this strategy. Here is the truth: if your child can read, he can write, and he can speak. Let me call it a magic! The key is to teach them to read Russian before they go to school, or before they start learn to read in English. Why? Simply because children are much more interested to use English language (it’s their primary/native language), and they will jump into it as soon as they see the opportunity. But when they have a good and solid skill in speaking and reading Russian, it is much easier to just continue building up these abilities throughout school years. And while we talk about reading, I cannot not to mention the beauty and an enormous advantage of reading in two (or even more) languages. It’s not just a winning position in our global multilingual world; It’s a natural and the most effective intelligence booster. 3. Books (obviously) – lot’s of interesting reading material, just about everywhere. 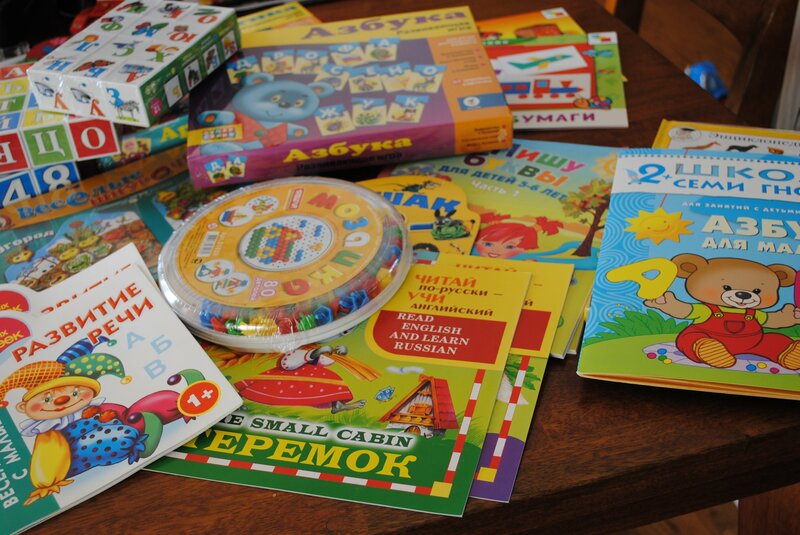 In other words, make your child to pick up a book (in Russian, obviously), when he doesn’t mean to. Just make sure that they are interesting to your child. My daughter loves reading, so I make sure that she always finds a good book to grab (and she always finds one in our books shelves). My son though (8), isn’t into reading, but, yet, he is up to my reading standards for him. Why? Because he reads every day. How come? Not difficult at all: I do my best to have a variety of a reading material that is interesting to him. He is such a scientist and astronaut, so books about rockets, titanic, as well as different encyclopedias are surely provided. 4. Friends! 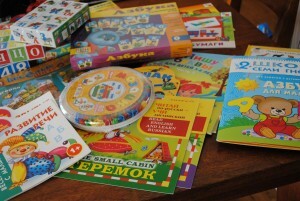 What a bonus for your child’s Russian (better than a tutor, really). Talking to friends is interesting and fun!!! Help your child find the company that will share the language. It appears, that this one is the most challenging, but it’s worth it! 5. Motivation – find a good one that will stimulate and encourage your child to learn Russian. Some examples include: being able to communicate to his/her grandparents, traveling back to country to meet great grandparents (uncles, cousins, etc), speaking the language of the largest country in the world (for Russian), more opportunities for travel, it’s a chance to become bilingual with no effort, cultural heritage, etc. If you find other motivators that are not listed here, please share them with me. I would love to hear more and to include them. 6. The early – the better! Child’s brain (before age 5-6) is basically limitless, and it’s the best time to “install” the languages in it with limited efforts. Don’t cease the opportunity and help your child become a genius (but before the child goes to school….schools are known to suppress that factor).